Bookcliff, a mid-size producing winery owned by husband-and-wife team John Garlich and Ulla Merz, isn’t what most people think of when they think of a winery. When people think of Colorado wineries, they conjure up images of Bookcliff’s Western-Slope competitors. The truth comes out, though, in the wine. It helps that Garlich and Merz have the whole Front Range at their disposal as their market. “As a Colorado winery, we have a lot of outlets,” Garlich said. “You have to do a lot of things to make it as a business. And so we sell to restaurants quite a bit, in fact that’s been one of our fastest growing segments, we were up 30-40 percent last year in restaurant sales. Although most wineries break into the industry through restaurants, Bookcliff’s business model had it selling to liquor stores first. Garlich said that made them focus on selling to liquor stores, in terms of competitive pricing and quality, and then move to other revenue streams, which is the opposite of how most wineries get started. Bookcliff sold primarily to liquor stores for the first 8-10 years they were in business. Wholesale sales, in restaurants and liquor stores, make up about 50 percent of Bookcliff’s sales, Garlich said. The rest of the sales, Garlich said, are a lot of moving parts. 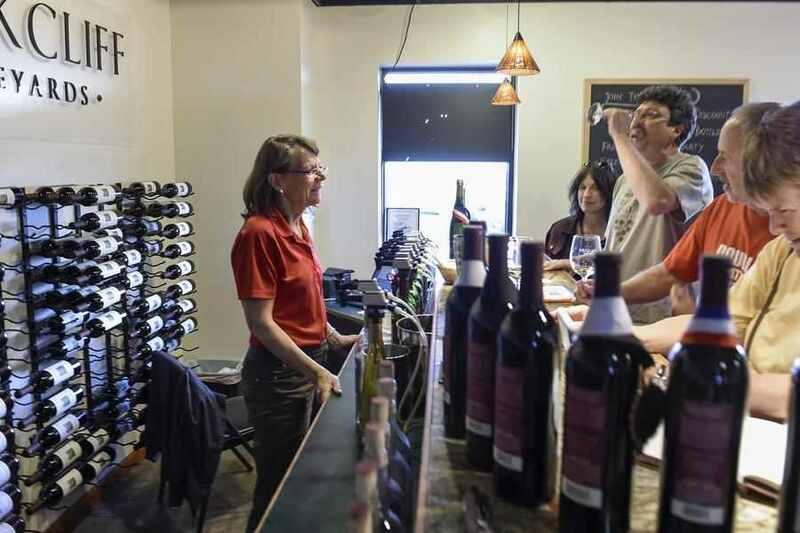 Bookcliff’s sells wine in their tasting room in North Boulder, at wine festivals, at farmer’s markets and through a wine club that they started. Garlich and Merz like being located on the Front Range, but there are drawbacks. The high prices have been worth it so far, though, because of the easy access to wine drinkers that the Western Slope doesn’t have. “We like to say there’s 4 million people on the Front Range and 200,000 beer drinkers on the Western Slope,” Garlich said. Bookcliff’s grapes, unlike some other wineries, all come from the state of Colorado. The vineyards are located in an area just east of Palisade, known as the vinelands. It’s a far cry from where they started. The drawback to growing all their grapes in Colorado is the harsh winters. Regardless of where the grapes come from, owning a winery is not for the faint of heart.